This module detects surprising events in the live video feed from the camera, and records short video clips of each detected event. Surprising is here defined according to Itti and Baldi's mathematical theory of surprise (see, e.g., http://ilab.usc.edu/surprise/) which is applied to monitoring live video streams. When a surprising event is detected, a short video clip of that event is saved to the microSD card inside JeVois, for later review. run it connected to a laptop computer, using any mode which does have some video output over USB (e.g., 640x500 YUYV). Adjust the camera orientation to best fit your needs. and see the above tutorial for more details. 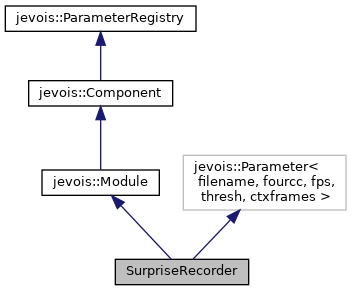 Next time you power JeVois, it will immediately start detecting and recording surprising events in its view. Here is one hour of video surveillance footage. It is very boring overall. Except that a few brief surprising things occur (a few seconds each). Can you find them? With only 6 surprising events, and assuming +/- 10 seconds of context frames around each event, we have achieved a compression of the surveillance footage from 60 minutes to 2 minutes (a factor 30x). Definition at line 124 of file SurpriseRecorder.C. Definition at line 132 of file SurpriseRecorder.C. Definition at line 139 of file SurpriseRecorder.C. Definition at line 145 of file SurpriseRecorder.C. Definition at line 156 of file SurpriseRecorder.C. Definition at line 175 of file SurpriseRecorder.C. References jevois::Profiler::checkpoint(), jevois::rawimage::convertToCvBGR(), jevois::RawImage::height, itsBuf, itsCtxBuf, itsSurprise, itsToSave, jevois::BoundedBuffer< T, WhenFull, WhenEmpty >::push(), jevois::RawImage::require(), jevois::Profiler::start(), jevois::Profiler::stop(), and jevois::RawImage::width. Definition at line 256 of file SurpriseRecorder.C. References jevois::Block, itsBuf, itsCtxBuf, itsFilename, itsFileNum, itsRunFut, itsRunning, itsToSave, JEVOIS_REGISTER_MODULE(), LERROR, LFATAL, PATHPREFIX, jevois::BoundedBuffer< T, WhenFull, WhenEmpty >::pop(), jevois::Module::sendSerial(), system(), and to_string(). Buffer for frames to save. Definition at line 323 of file SurpriseRecorder.C. Referenced by postUninit(), process(), and run(). Buffer for context frames before event start. Definition at line 321 of file SurpriseRecorder.C. Referenced by process(), and run(). Definition at line 327 of file SurpriseRecorder.C. Referenced by postUninit(), and run(). Definition at line 325 of file SurpriseRecorder.C. Future for our run() thread. Definition at line 320 of file SurpriseRecorder.C. Flag to let run thread when to quit. Definition at line 326 of file SurpriseRecorder.C. Definition at line 251 of file SurpriseRecorder.C. Referenced by process(), and SurpriseRecorder(). Number of context frames after end of event that remain to be saved. Definition at line 324 of file SurpriseRecorder.C.